Welcome to HCST'S Lynda.com Online Training Library®, a comprehensive collection of video tutorials and online courses on a variety of software and design topics. Using this guide, you will be able to create your user profile in 2 quick steps. 2. Click on the blue “create a profile” button. 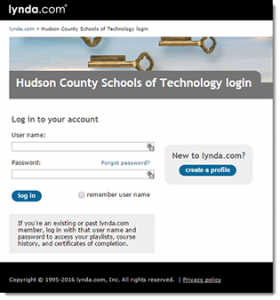 Your first login must be done from school and your user name is your school email address(@hcstonline.org). Once registration is complete, log into your user profile by going to www.lynda.com. Click log in at the top, right corner of the page and enter your user name(HCST email address) and password.